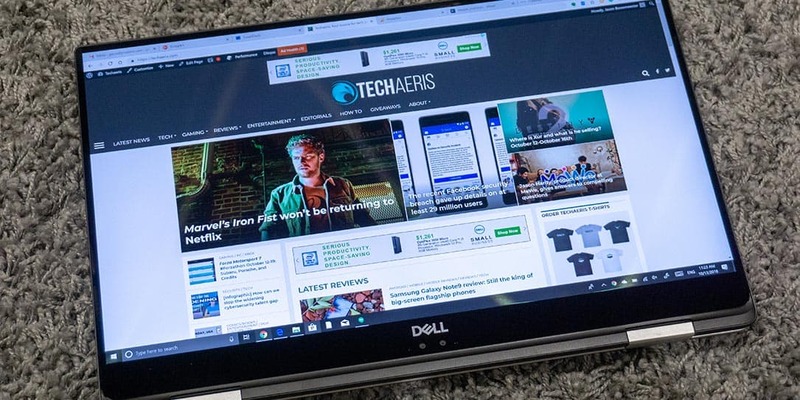 If you’re looking for a premium, durable, portable laptop, the Dell XPS 15 2-in-1 won’t let you down with its amazing screen, build quality, and performance. 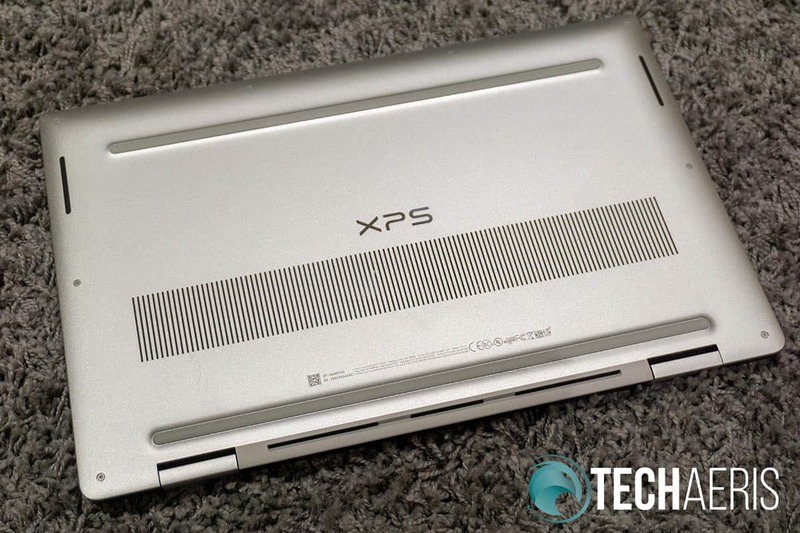 We’ve long been fans of the Dell XPS series here at Techaeris and it’s time for a review of one of the new versions with a new feature. 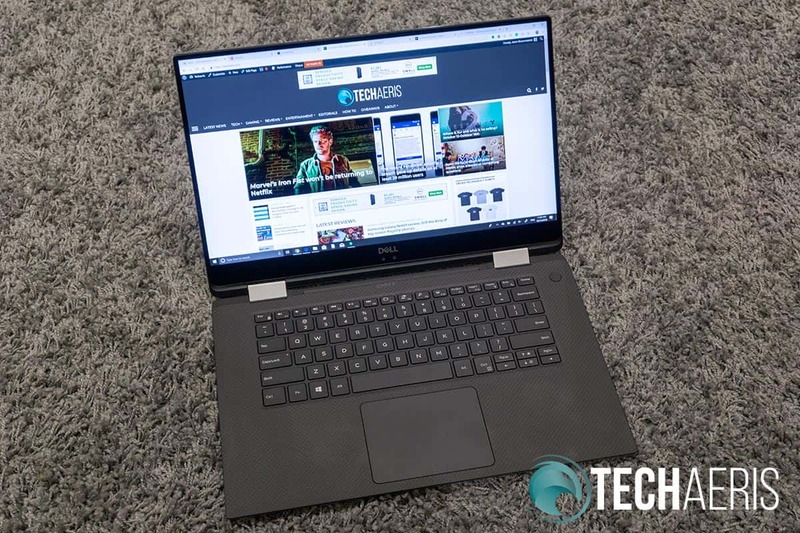 Our Dell XPS 15 2-in-1 review takes a look at the company’s first XPS 15 with a flexible hinge that allows for laptop, tablet, or tent mode use. Dell’s XPS laptops have always had a premium design and the XPS 15 2-in-1 is no different. Built with machined aluminum, carbon fibre, and Corning Gorilla Glass, this laptop not only looks good but offers great durability. The top of the lid is pretty standard for this series and is silver in colour with the Dell logo imprinted in the center. The lid is attached to the main body by way of a pair of aluminum wrapped steel hinges. Upon opening the laptop, you are greeted with the carbon fibre palm rest which wraps around the rest of the keyboard. The familiar Dell XPS laptop look. 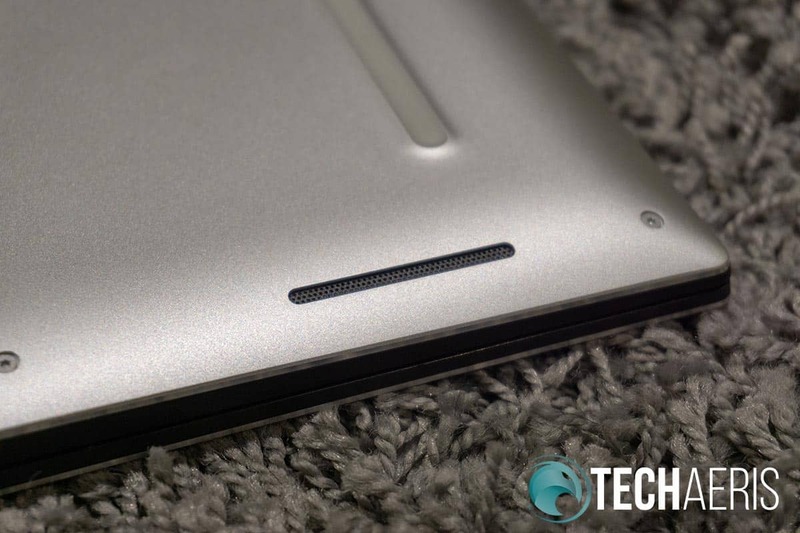 The large precision touchpad is front and center with left and right click regions on the bottom of the touchpad. The touchpad is responsive and smooth and works well, although I still personally prefer an external mouse. Combined with the touch screen, however, I found that the touchpad and screen work well in combination when you don’t have a mouse handy. MagLev relies on the magnetic attraction of a magnet and a metal plate. The magnet is attached to the keyboard frame while the metal plate is part of a butterfly mechanism consisting of the metal plate and two plastic arms. The metal plate is attached to the magnet which causes the arms at the edges of the butterfly mechanism to be lifted, thus lifting the keycap. As a user presses down on the keycap, the arms move down and separate the metal plate from the magnet. The arms then lower and touches the membrane which causes key activation. As the user’s fingers lift off the keycap, the metal plate is then attracted to the magnet moving the key back to its rest position. Finishing up with the keyboard, the arrow keys are located on the bottom right and are of the half-sized variety with the PgUp and PgDn keys. Aside from that, the keyboard is pretty standard with your typical Fn keys across the top. The Fn keys double as media and volume control, search, backlight intensity, display modes, and desktop switching shortcuts. The power button is located in the upper right corner and doubles as a fingerprint scanner (an optional feature which was included with our review unit. The MagLev keyboard and touchpad. 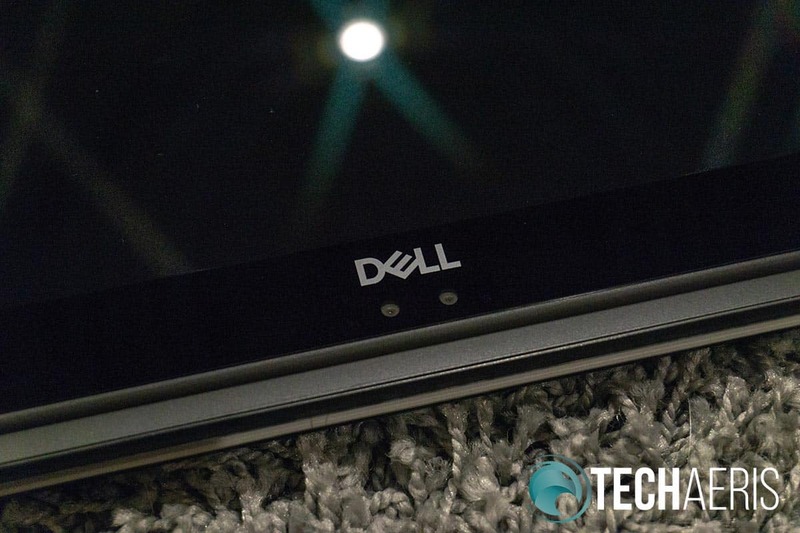 We’ll get to the 15.6-inch 4K display more in the next section, however the cameras are located centered on the bottom bezel below the Dell logo. This design feature is necessary to accommodate the mere 5.2mm top and side bezels of Dell’s InfinityEdge design. The touchscreen functionality worked as expected and was very responsive. The Webcam with Windows Hello support is located near the bottom of the display. 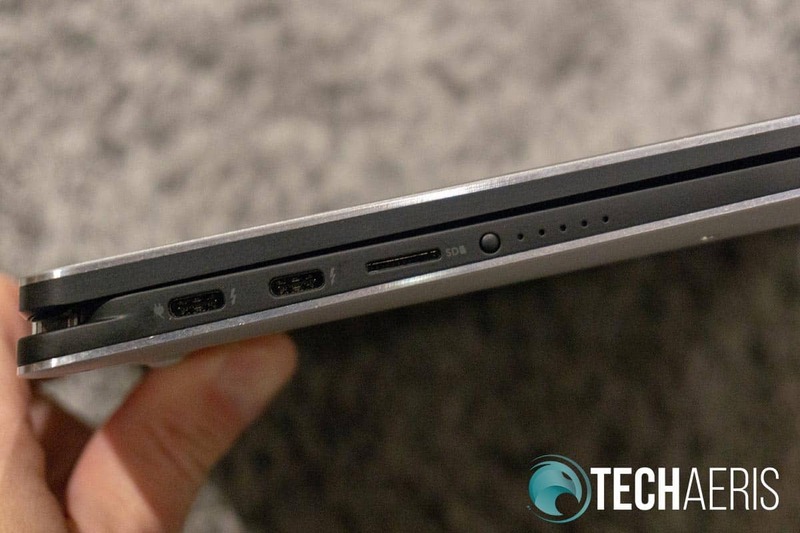 As far as your ports are concerned, two USB-C Thunderbolt 3 ports with PowerShare and DC-In are located along the left side of the laptop. A microSD card slot and battery gauge indicator also round out the left side. 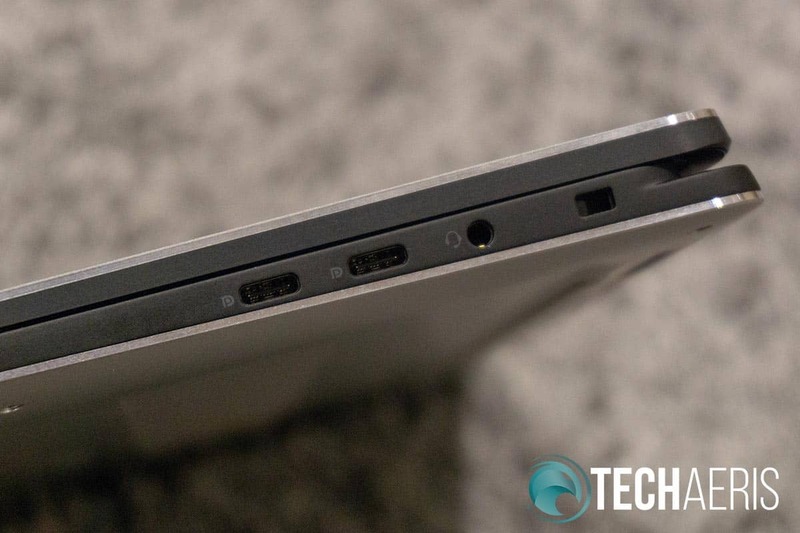 The right side of the laptop sports a Noble lock slot, 3.5mm headset jack, and two USB-C 3.1 ports. While there are no USB-A ports present, having four USB-C ports to choose from definitely future proofs the XPS 15 2-in-1. In addition, there are plenty of ports to connect a USB-C hub to add Ethernet, USB-A, and other common ports that you may need. The ports on the left side of the laptop. The bottom of the laptop features a large slotted fan area which runs across the width of the laptop. Two rubber bars also run across the width, elevating the laptop when it is placed on a table for proper airflow. 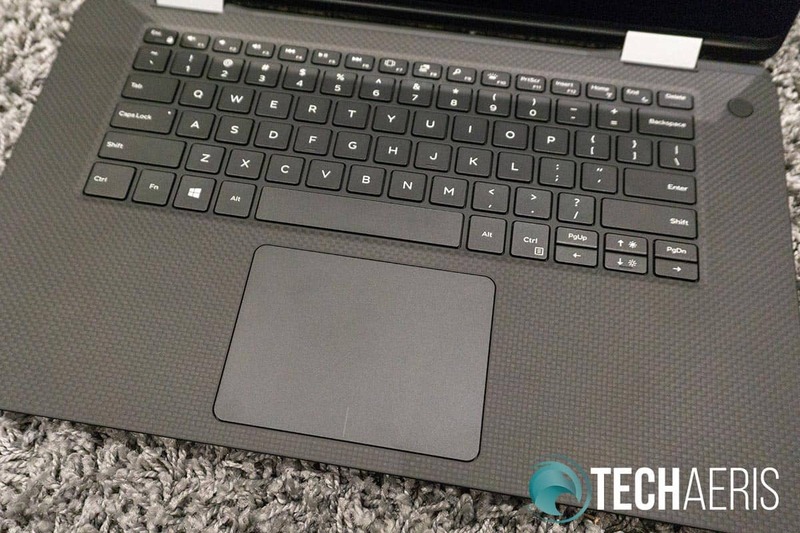 The stereo speakers are located on each side of the laptop near the front and fire down onto your desk/table, or the back of the lid when used in tablet mode. Speaking of tablet mode, the XPS 15 2-in-1 is Dell’s first 15″ XPS 2-in-1. While a welcome feature that allows you to use it in laptop, tent, stand, and tablet mode, it does feel a bit unwieldy in tablet mode. That being said, we didn’t have the opportunity to test it with the Dell Premium Active Pen. I suspect that when used in tablet mode in conjunction with that, it might be a different story. When used in tablet mode, the laptop can field a tad unwieldy. The XPS 15 2-in-1 is pretty thin, coming in at only 0.36-0.63-inches (9-16mm) thick when closed. It also has a pretty compact form factor and is only 13.9-inches (354mm) wide and 9.2-inches (235mm) in depth. It does weight a bit, starting at 4.36lbs (2kg) but is definitely manageable. Our review unit came with the 15.6-inch UltraSharp 4K Ultra HD (3840×2160) InfinityEdge touch display which features 100% Adobe RGB coverage. To say the display is a treat would be an understatement. It is super crisp and clear at this size and resolution. Of course, the scale had to be jacked up and I found 200% to be the perfect balance between retaining real estate and crispness. The 4K UHD UltraSharp screen is bright, rich, and crisp. One thing I did find, however, is that I found the display super bright with its 400 nit brightness and 1500:1 contrast ratio (not necessarily a bad thing if you tend to work in well-lit areas). It was also a bit on the oversaturated colour side. That could also be because I’m used to monitors and screens with sRGB coverage as opposed to one with 100% Adobe RGB coverage. In some ways, it reminds me of the oversaturated default of Samsung smartphone displays. At the end of the day, I did get used to — and appreciate — the richer colours. 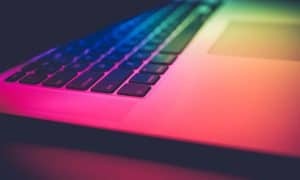 I tended to use the laptop at about 40% brightness during the day and about 20% during the evening and found those to be plenty bright enough. Nothing really to say here. The XPS 15 2-in-1, as tested, ships with Windows 10 Home. Windows 10 Pro is also available if you need the few extra features of that. That being said, Windows 10 ran smooth and worked well in all four modes the laptop is capable of. As far as bloatware, there are a few Dell apps like Dell Digital Delivery and Dell Mobile Connect, as well as McAfee that come pre-installed. For the most part, the included apps are non-intrusive and actually useful for keeping your system up to date. On that note, Dell Mobile Connect is an interesting app which allows you to make calls, send and receive texts, get notifications, and even mirror your smartphone on the laptop. During our quick test of it, it seemed to function fairly well. Given that Microsoft is currently working on Android integration with Windows 10, it’ll be interesting to see what Dell decides to do with this app in the long run. Our review unit was obviously maxed out with the 8th Gen Intel® Quad CoreTM i7-8705G processor, 16GB RAM, and a 512GB SSD drive. 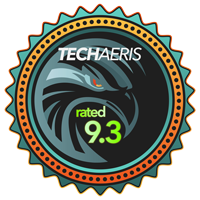 As such, all the apps we tested ran smooth and loaded quickly with no issues. This machine can definitely handle everything from basic web browsing and document editing to more demanding apps like Adobe Photoshop and Lightroom for photo editing. 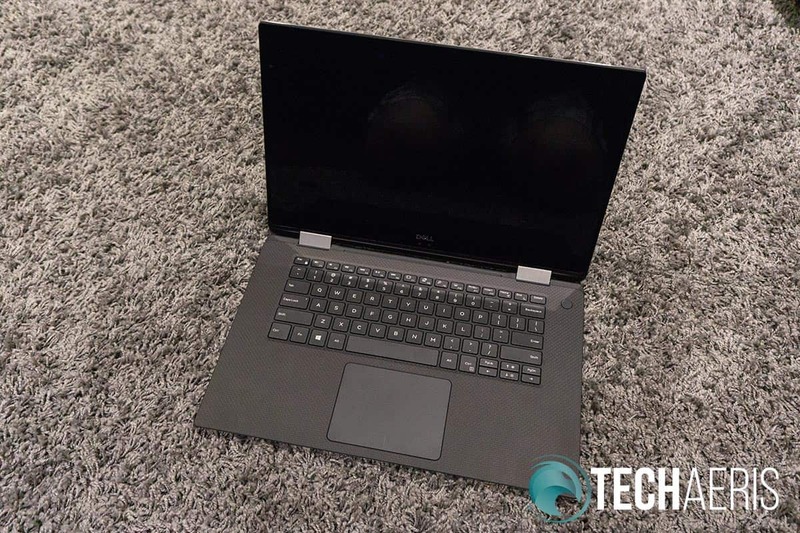 The XPS 15 2-in-1 also sports the Radeon RX Vega M GL graphics card with 4GB HBM (high bandwidth memory) RAM. This was my first experience with the Radeon mobile card and it was definitely with mixed results. Being used to NVIDIA cards the RX Vega was a pain to update. Even though the Intel AMD Settings app indicated the driver was up to date, it wasn’t and I ended up eventually figuring out that you have to do it via the Intel site. Even worse, the driver that the system was complaining about needing to be updated to wasn’t even listed on the Intel site which used a different numbering format. While the RX Vega detected apps and games that could benefit from it’s added graphics power, there were a couple times I had to manually add the app or game in the Intel AMD Settings app to force it to use the RX Vega. Unfortunately, this was a huge pain for UWP apps and games. The bottom of the XPS 15 2-in-1, complete with ventilation slots. On the gaming front, I was able to run Heroes of the Storm on Ultra 4K settings 35-70fps, averaging around 40. When lowered to high settings, the average was about 57fps which is reasonable given the 4K resolution of the screen. Of course, I had to try out Forza Horizon 4 and unfortunately was unable to get it to load. At first, the system complained of an unsupported video card as it tried to run on the Intel UHD instead of the RX Vega. 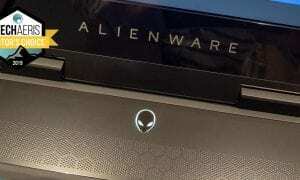 The second launch, it did try to run on the RX Vega but said it had an outdated driver. After finally getting the driver updated, the game did launch but as soon as it hit the Continue menu, it crashed. On that note, I couldn’t verify if the game is even supported on the RX Vega mobile cards, but it is something to keep in mind if you’re planning on gaming with this as well. An interesting thing to note. You may wonder why the computer has a gyroscope and other sensors inside it. Dell included these for adaptive cooling and fan operation. When the system detects that the system is flat and not moving, the system will perform better. When it does detect movement or angled use, it assumes you’re using it on your lap and the vents may be partially covered. As a result, performance may drop slightly to prevent overheating due to limited ventilation from the dual fans. Even though the XPS 15 2-in-1 sports a pair of 1W speakers, they are rather loud and crisp. While the lack of bass is obvious, they are more than adequate for watching videos or listening to music. While gaming, the left and right sound channels were very apparent and it definitely added to, rather than detracting from, the experience as is often the case with laptop speakers. The dual 1W speakers put out a surprising amount of sound. The widescreen HD (720p) webcam worked well enough during our test video chats. It also works great for Windows Hello login should you choose to set that up for logging into your system. According to Dell’s MobilMark 2014 tests, this configuration gets up to 9 hours and 31 minutes of battery life (8 hours, 27 minutes during video playback tests). For testing, I was doing some basic web browsing, document editing, streaming video, and listening to Spotify with the screen set to 40% brightness. We also had a USB-C hub connected for use with a mouse and wired Ethernet connection. With the Power Mode set to Better Performance, I consistently got around 4 hours of battery life between charges. When I adjusted the Power Mode to Better Battery, I was able to get between 5 1/2 and 6 hours which is definitely better but not near what Dell indicates. Given the components and 4K screen, however, six hours is still pretty decent and of course reducing background apps like Spotify running in the background will only increase your battery life. But hey, we test real-world usage here at Techaeris and I’m a fan of background music while working. With a starting MSRP of $1,299.99USD ($1,899.99CAD), our review unit as configured will set you back $2,209.99USD ($3,329.99CAD). With specs like the i5-8305G Processor, 8GB RAM, 128GB SSD, and a 15.6″ FHD touchscreen, the starting MSRP is a pretty reasonable price for what you get. If you’re planning on using this for a couple (or more) years, there is also definitely some value in getting the faster processor, higher resolution screen, and more storage space. The Dell XPS 15 2-in-1 definitely fetches a premium price, but the components, build quality, and usability are definitely worth it. Ports on the right side of the laptop. Dell currently has a 10% off sale, so you can save yourself a bit of cash if you’re looking to pick one of these up. 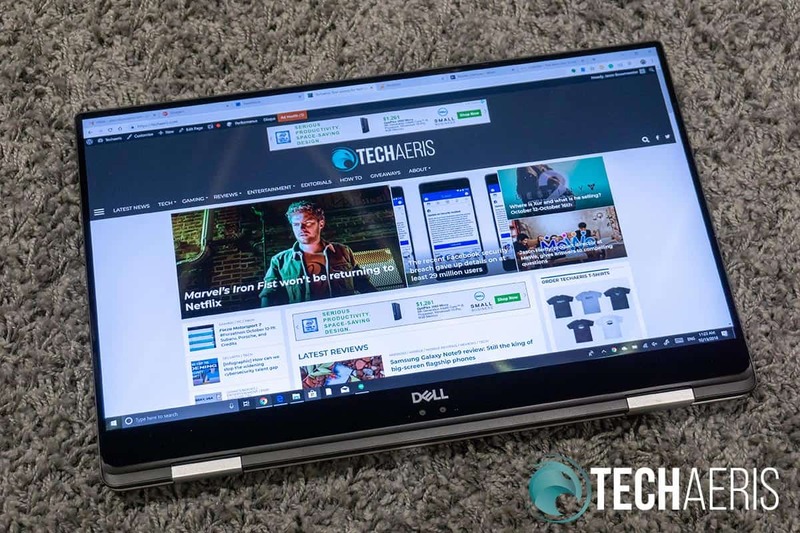 If you’re looking for a premium, durable, portable laptop, the Dell XPS 15 2-in-1 won’t let you down with its amazing screen, build quality, and performance. While it is pricey, there are other configurations that are more affordable to help soften the blow to your wallet. 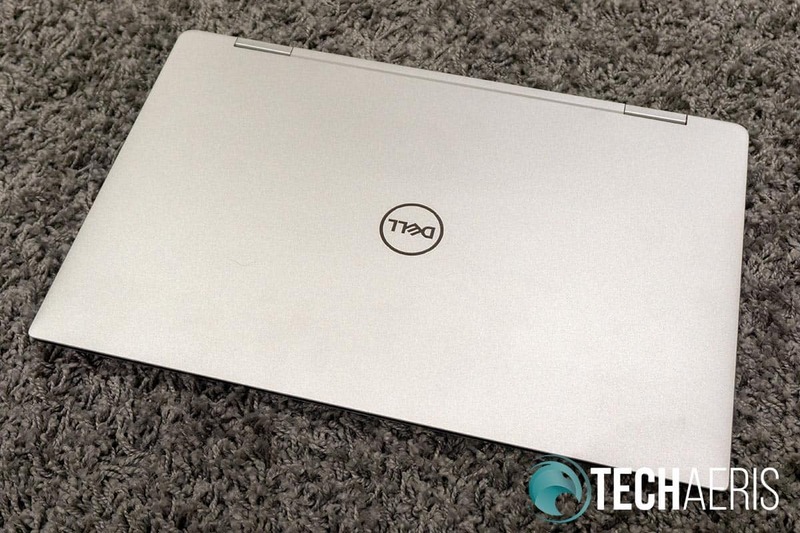 *We were sent a review unit of the Dell XPS 15 2-in-1 for the purposes of this review.